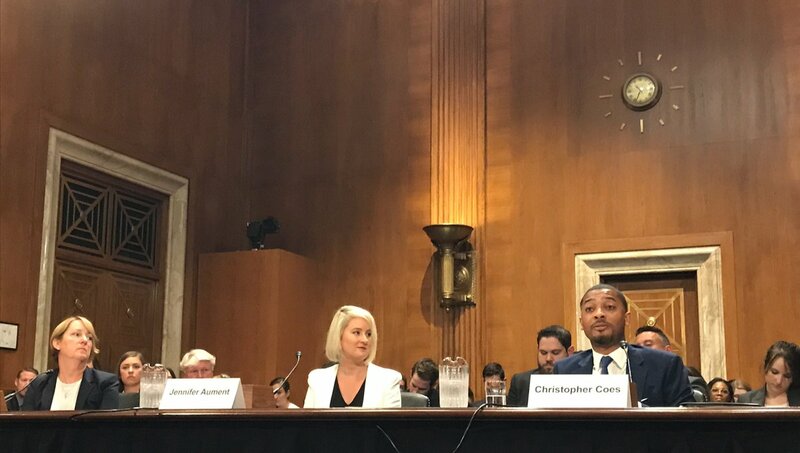 The hearing focused on the nation’s enormous need for infrastructure investment, and how Transportation Infrastructure Finance and Innovation Act (TIFIA) loans can help meet it. Christopher Coes, Vice President for Real Estate Policy and External Affairs, joined the hearing to testify. The Senate passed its final six-year transportation reauthorization bill today, and included in the bill is a provision to expand the eligibility of transit-oriented development (TOD) projects for federal TIFIA financing. The provision would also expand financing for infrastructure projects that promote transit ridership, walkability, or increased private investment. U.S. Secretary of Transportation Anthony Foxx testified before the Senate Committee on Environment and Public Works this morning on a number of issues related to the next transportation bill. Senator Edward Markey (D-MA) asked the Secretary what role, if any, transit-oriented development should play. Yesterday, Senate EPW Chairman Barbara Boxer (CA) and Ranking Member David Vitter (LA) released a draft bipartisan six-year, transportation reauthorization. For the first time, the bill includes a transit-oriented development (TOD) financing provision that LOCUS has strongly supported. As proposed, the TOD financing provisions provide local communities the tools needed to leverage greater private sector investment and economic development around public transportation through the highly successful TIFIA program. Yesterday, the Senate Environment & Public Works Committee released the MAP-21 Reauthorization Act (S. 2322), a bipartisan bill that reauthorizes the Federal transportation program through 2020. Geoff Anderson, President & CEO of Smart Growth America, issued the following statement in response. “I applaud Senator Boxer and Senator Vitter for advancing this bill to provide immediate and stable funding for America’s transportation networks. How we build our nation’s infrastructure has tremendous implications for neighborhood development and the economic resilience of our communities. The proposed bill includes provisions that will help local communities grow in smarter, stronger ways. “We strongly applaud the inclusion of a provision to provide financing support to help communities create economic development along transit corridors. We are thankful for the strong leadership demonstrated by Sen. Schatz (HI), as well as Sens. Markey (MA), Gillibrand (NY), and Merkley (OR) in highlighting the growing need to support reinvestment in our communities. This measure will allow communities to better realize the potential of their transit systems, grow their economies, provide families with more housing and transportation choices while giving both the private and public sectors the financial tools to help make it happen. We are also pleased that the bill takes key steps to improve safety for all users of the transportation system, specifically adding safety performance measures for both motorized and non-motorized travelers. “Seattle Streetcar,” by Flickr user Sean Marshall. For those not familiar, they could be forgiven for mistaking the opening speaker at this month’s Transit Financing Workshop in Seattle for an ardent smart growth advocate. And in many ways he is. He just also happens to be the Mayor of Seattle. Mayor Michael McGinn’s comments about the critical role walkable neighborhoods and transit play in economic development set the stage for a day-long event about transit-oriented development in the Puget Sound region on October 4, 2012. Sponsored by Transportation for America, LOCUS Washington, the Transportation Choices Coalition, ULI Northwest and the Quality Growth Alliance, the event brought together leaders from the business, real estate, advocacy, and government sectors to discuss transit, transit-finance, and how the Seattle region can better position itself for future growth. The Navy Yard Metro station in Washington, DC is a recent example of development near transit stations. Photo by Flickr user M.V. Jantzen. The hotly debated federal transportation bill could better support development near transit stations – if the House and Senate adopt a key amendment in their negotiations. Members of Smart Growth America’s LOCUS, a coalition of real estate developers and investors, are gathering in Washington this week to call on Congress to pass a transportation bill that makes it easier to build transit-oriented and walkable development projects across the country. LOCUS developers will deliver that message as part of the 2012 LOCUS Leadership Summit, a three-day event that includes educational forums, walking tours of smart growth in the DC region, the inaugural LOCUS leadership awards and presentations by Obama Administration officials.